Challenge #15 was to be in the audience of a TV show and recently I got the opportunity to do just that when I was invited to attend the Sky News Labour Leadership Debate. I know a lot of people wouldn’t find this exciting but for me it was perfect. You see I’m a bit of a political animal. I’m not a member of any political party – I’d find it far to difficult to toe any party line – but as a UNISON member I am a registered supporter of the Labour Party so could vote in the election. I’d thought a lot about who I was going to vote for but hadn’t made my final decision so a chance to hear from all the candidates in person was just what I needed to help me make my mind up. So when I heard the debate was going to be in Gateshead I knew I had to apply. What I didn’t realise was the debate was being held on a day when I had to be in London. So I filled in the online form, added a question I wanted to ask and pressed send. A few days later I got a call asking if I was still wanted to attend and of course I said yes. I went through the security checks and was told I would get an email early the following week if I have been selected. I was really excited and convinced I would get to go but as I put the phone down it hit me. If I was selected I wouldn’t be able to go. The event was scheduled for the Thursday and as I hadn’t heard anything by Tuesday I put it to the back of my mind. The next day I got the train and of course that’s when the email arrived. I’d been selected. I was devastated but there was nothing I could do so after checking in to my hotel I replied saying I wouldn’t be able to make it. And that was that – or so I thought. As I headed over to the UNISON Centre for the meeting the next morning my phone rang. As I was crossing a busy road I didn’t answer it but listened to the message. It was Sky – or at least the company organising the event – asking me to check my emails. They wanted me to attend and they wanted me to ask my question. And as long as I arrived by 6pm (the original time was 4pm) I would still be able to attend. How could I not go? It was so unfair. After talking to a couple of people I decided I should leave the meeting early and get a train back to Newcastle. After all I could say I was from UNISON and make sure I asked a question on behalf of Disabled Members. Now I’m not going to go into the full details of the journey but let’s just say the train ran late, the traffic in Newcastle was horrendous and I only made it to the Sage with minutes to spare. I shouldn’t have worried. It was probably the most disorganised event I have ever been to – nothing was on time, there was no structure and everyone just kind of piled in together but at least I was there – in the audience – waiting to hear what was said – waiting to ask my question. The Stage Manager came on stage and told us what would happen and when we should clap – I’m sorry but I only clap when I want to. Then the presenter, Adam Boulton, came out and repeated what the Stage Manager had said. Then the candidates came on stage but still there was no debate. Finally after about an hour and half of waiting around we went live. The audience was supposed to be evenly selected based on who they were likely to vote for but there were clearly more Jeremy Corbyn supporters in the audience than anything else – but at least I was sure the presenter would make sure they all got the same chance to speak. How wrong could I be. The first question was asked and each candidate was given the chance to answer. 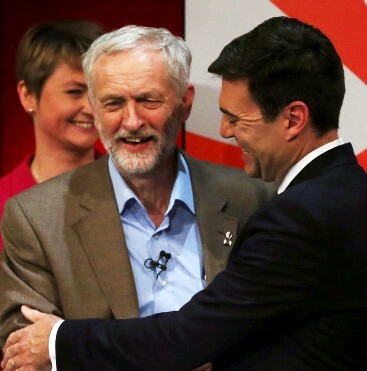 But then the presenter asked a supplementary question – but only put it to Jeremy Corbyn. And this was pretty much the pattern for the rest of the debate. 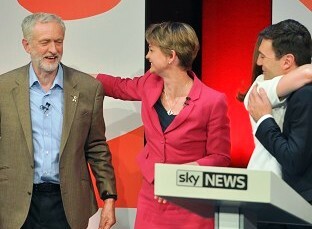 At one point the presenter tried to bring Corbyn back in on a question that Yvette Cooper hadn’t even had the chance to answer. This was disappointing to say the least. There were a couple more questions from the audience and a couple from viewers at home that had been sent in via twitter but Adam Boulton asked more questions than anyone else. And me – well they never got round to asking my question. Now I know it might sound like sour grapes but surely the audience should get to ask more questions than the presenter and sure there shouldn’t be more questions directed at one candidate than the others. The most interesting bit came at the end when each candidate got to ask one of the others a questions. 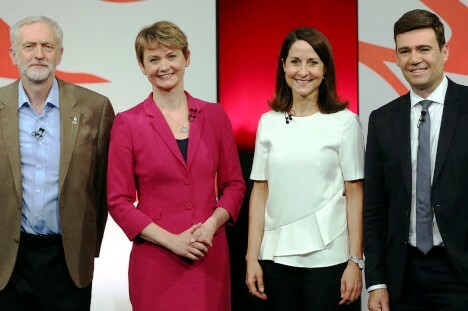 It was clear who they thought would win and who was playing for a role in the Shadow Cabinet. So in short I enjoyed it but I will never watch an election debate in the same way again.